Do you shop for that very special Christmas gift or any gift for that matter? I do and I spend hours trying to find THE perfect gift. I want a gift that captures a bit about the person I'm giving it to and when I can find the right one, I can tell when they open it. This year, I was at a loss to really find that one gift that my oldest would love. 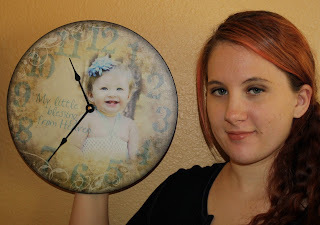 Luckily for me, I was contacted by For All Time Clocks for a review and giveaway and definitely wanted to participate. What I can say is the pictures on the website do not do the clocks justice as they are just beautiful! You can customize a clock or you can purchase a pre-made clock. They have a nice selection of clocks to fit any decor or age. I chose this adorable picture of my grand baby and her mom (i.e. my daughter) is holding the clock in this one. I originally told her the clock was mine when I ordered it and then when it arrived, I surprised her with it. She was so delighted and her reaction when she saw it was, 'oh that is so cute! I love it!' I have to admit that I'm surprised at how nice it turned out. I couldn't really envision how it would look but I can definitely say that I love it! 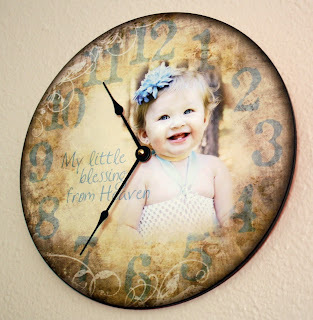 They did such a great job with superimposing the photo to the face of the clock to make it blend beautifully. It's a wonderful gift to give at any occasion and will delight whomever you give it too! Customer service is amazing too and I really cannot say enough as it's the type of gift that I hunt for to offer that personalization that shows love. You can choose the quote or you can choose from a selection they provide. There are templates available to help you create the most wonderful gift. Web link ideas to expand on. Testimonial page to ensure you are getting the very best and you can check out For All Times Clocks in our Christmas Guide too. One reader will win an e-certificate for a free 12" custom clock. *Disclaimer: I received a complimentary product for this review and giveaway. The opinions are of my own. These gifts are "timeless"--you find the neatest things!